It took for me three evenings to finish this entertaining and young novel. Since this is a new edition with somewhat updated material, the voices of the authors stayed young, fun, funny, and nice to read. On page 166, in the updated section, the authors tell us to burn the first edition if ever found. Actually, I wouldn’t burn it, but would explore it to find Fox Mulder and his partner Scully. 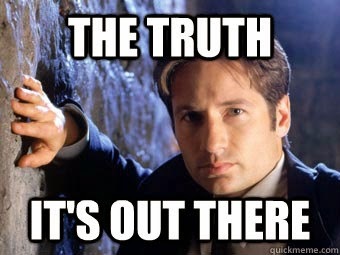 To tell you the truth, though I have known about the TV show- X-Files for years, I did not watch it until 2015. When I started watching the show in 2015, I finished all of the episodes in two months and couldn’t wait for season 11 which I watched as well, though sadly was disappointed. Okay, back the review, but in my defense, the girls in “Ghosts from the past” got distracted a lot like when Erin raised her hand to say that she likes doing paperwork, section about flashlights, and when they were defending all women out there. The book is divided into 4 parts and all of them were entertaining, especially the Elis Ley Line Map on page 91 which look confusing and more of an art pice than map, raccoons, their definitions, and the proton pack warnings. From my experience with my friends pack (that her husband made for her), the warnings are true. I do admit that she did pointed it at me but the time I was dressed up like a ghost (and looked good) and we were performing to the Ghostbusters theme song. Are you guys jealous yet? Her pack also made sounds! Below is a photo of my friend’s collection. You can see the packs and the costumes. Also, since it wouldn’t be right to share the photos of the illustrations from inside the novel, here are a couple of photos that I can share. However, to learn more about the packs, read pages 136 to 137. There’s also a photo of her drinking at the movie theatre, but considering an important rule found on page 152, it is a bad idea to drink before a job so I will not share it with you, though technically she was off the clock from ghost hunting. Okay, again back to the review. What I really liked about the book is about all of those tips! Especially on the essential tools to have with you when ghostbusting. However, the girls forgot to add the note about food, but they do talk about it later. Also, I think their college professor would be okay with them telling the world that he was into ghosts because he passed away before their wrote the first edition and everybody knows that talking ill of the dead is not a good idea. I love books with accommodating images and guides and this book has plenty. Considering the fact that first edition had a lot more, I wish I could have seen those illustrations. The girls after all did take classes on art… If I remember correctly. I highly recommend this novel to someone who likes having a good laugh. It’s definitely a mood raiser. I would say a minimum age requirement of 18 and up because only eighteen years old and older could relate to having Chinese take out, spending time in libraries and coffee shops, and of course having friends who back each other’s back. Erin and Abby sound like a best friend pair that would stay best friends and I think that though many years separated them, they can still do some Ghostbusting together. I will have to get this book. Sounds like a good read. Awesome review, this is a book I think I would enjoy tremendously. Also, I’m super jealous of your friends glorious collection. Thanks for sharing this! Hehe. Glad you liked it. This one was fun to write because I was able to spice it up with my friend’s collection. It was like perfect. haha Glad you liked it. My friend is awesome and she allowed me to share them so its really cool. Those pictures were perfect for the post. That friend is DEFINITELY a keeper! !